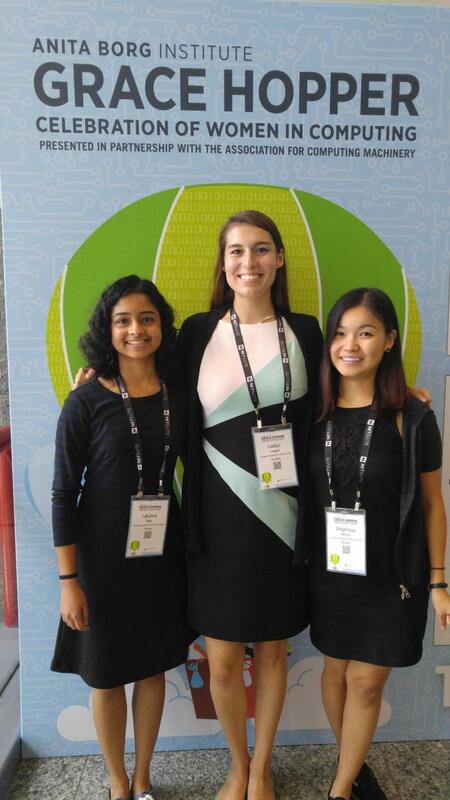 ECE students Delgermaa Nergui, Caitlyn Caggia, and Lakshmi Raju attended the Grace Hopper Celebration of Women in Computing in October 2016. Being a woman in a technology field can sometimes be lonely, but imagine a gathering of 15,000 women involved in science, technology, engineering, and math all in one place networking, learning, and sharing stories. Look no further than the annual Grace Hopper Celebration of Women in Computing. Inspired by American computer scientist and United States Navy Rear Admiral Grace Murray Hopper and presented by the Anita Borg Institute for Women in Technology and the Association for Computing Machinery, the event has been growing bigger each year since its founding in 1994. This year, three Georgia Tech School of Electrical and Computer Engineering undergraduate students were able to attend. 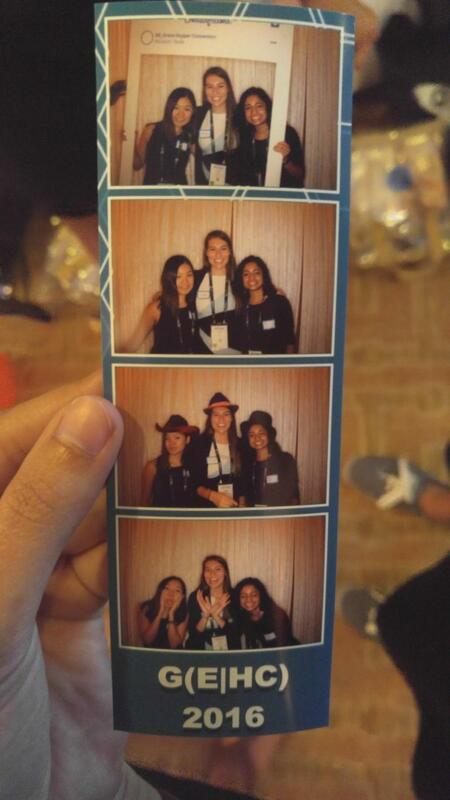 Caitlyn Caggia, Lakshmi Raju, and Delgermaa Nergui, who are all electrical engineering majors, were sponsored by the Women in Electrical and Computer Engineering (WECE) student organization. The organization took care of their travel expenses and the conference registration. The three-day event, which took place October 19 – 21, 2016, provides female technologists from all over the world the chance to celebrate the achievements of women in the computing field. The event includes presentations by influential entrepreneurs, academics, and business leaders—all in the fields of computing and technology. Also on offer are ample opportunities to network and socialize, professional development activities, and a career fair. Caitlyn Caggia describes it as the perfect way to transition from being a student to being a professional. At first concerned that the conference would have too narrow of a focus on computing, the Georgia Tech women quickly learned that there were a variety of topics relevant to women in technology in all stages of their careers, from students to executives. In fact, being an electrical engineer had a decided advantage in terms of talking with recruiters. “There were hundreds of companies recruiting from Google and Facebook to J.P. Morgan Chase to Hewlett-Packard. Being an electrical engineer came in handy as EEs were in short supply at the conference and it was a great talking point with many recruiters,” said Raju. The conference was organized by thematic areas of interest called “Clusters” which included Technology, Products A to Z, Open Source World, Emerging Technology, Career, and Organization Transformation. Featured keynote speakers included Ginni Rometty, CEO of IBM; Susan Cain, author of Quiet: How to Harness the Strength of Introverts to Transform How We Work, Lead, and Innovate; Latanya Sweeney, professor at Harvard University and Editor-in-Chief of Technology Science; Marc Benioff, CEO of Salesforce; and Megan Smith, the United States Chief Technology Officer (CTO) in the Office of Science and Technology Policy. One panel that was a favorite of the Georgia Tech students was Insights from the Top Companies Leadership Index featuring senior technologists from Intel, Accenture, Allstate, and Bank of America. The four women who made up the panel described how they are increasing representation of women technologists in their companies through recruitment, retention, and advancement. “There was some really genuine, encouraging feedback from executives about what they’ve done to inspire lasting change. One particularly memorable speaker was a woman from Intel. She discussed some best practices at Intel that really worked, and also went through some of their well-intentioned attempts that ended in complete failure. For example, forcing company-wide educational sessions was less effective than one-on-one mentoring type programs to increase exposure and awareness,” said Caggia. The three-day trip also included multiple interviews with industry representatives and lots of useful tips for developing new skills and finding your dream job. In addition to gaining insight into what they may want to do after they graduate, Caggia, Raju, and Nergui appreciated the general sense of comradery, the high energy atmosphere, and the wisdom imparted by women who are paving the path for future generations of female technologists. 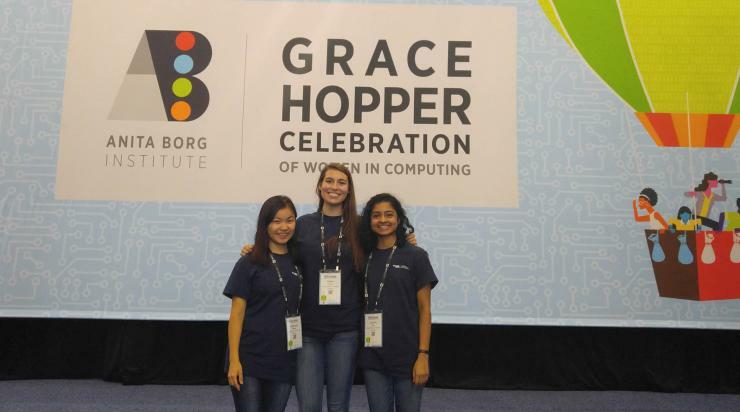 The Grace Hopper Celebration welcomed 15,000 attendees this year. Lakshmi Raju, Caitlyn Caggia, and Delgermaa Nergui were sponsored by Women in Electrical and Computer Engineering (WECE), which paid for their expenses. 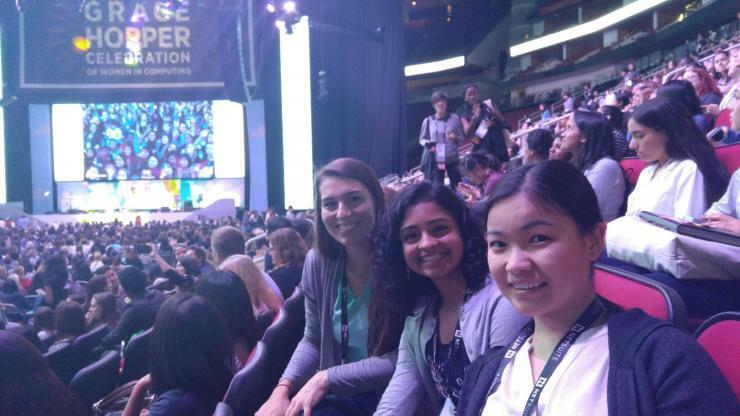 Electrical engineering majors attend the Grace Hopper Celebration in Houston, Texas. Networking and social events were a hit with the students.